It was a phrase that consumed the American imagination in the 1960s and 70s and inspired a new agenda for black freedom. Dynamic and transformational, the black power movement embodied more than media stereotypes of gun-toting, dashiki-wearing black radicals; the movement opened new paths to equality through political and economic empowerment. 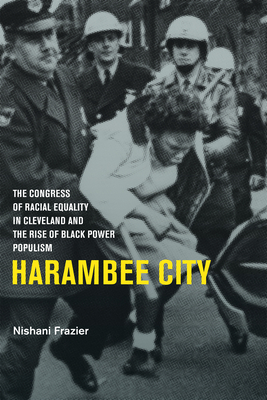 In Harambee City, Nishani Frazier chronicles the rise and fall of black power within the Congress of Racial Equality (CORE) by exploring the powerful influence of the Cleveland CORE chapter. Frazier explores the ways that black Clevelanders began to espouse black power ideals including black institution building, self-help, and self-defense. These ideals challenged CORE’s philosophy of interracial brotherhood and nonviolent direct action, spawning ideological ambiguities in the Cleveland chapter. Later, as Cleveland CORE members rose to national prominence in the organization, they advocated an open embrace of black power and encouraged national CORE to develop a notion of black community uplift that emphasized economic populism over political engagement. Not surprisingly, these new empowerment strategies found acceptance in Cleveland. "Historian Frazier (Miami Univ.) uses extensive oral histories and archival sources to provide a detailed account of the mid-20th-century intermittent development of the Cleveland Congress of Racial Equality (CORE). Supporting analysis of CORE’s national leadership frames the Cleveland story. Acknowledging both the ideals put forth in organizational materials and the reality of members’ actions, she shows how conflicts over interracialism and nonviolence played out at local and national levels. Frazier also demonstrates the organization’s dependency on individual leaders (many of them women) and financial support. Her account joins those of other scholars in tracing the historical development of black power prior to 1966. In this case, black leadership that emphasized self-determination emerged in Cleveland CORE in the early 1960s. The chapter’s wide-ranging struggles with school desegregation, McDonald’s, and the Ford Foundation illustrate the complexities of the black freedom movement in the urban North. Particularly useful is Frazier’s examination of CORE’s embrace of communal capitalism as a foundation of economic development in the late 1960s."